I knew it was bad news when I realized the easy bike ride I have to Ample Hills Creamery. It's just long and hilly enough for me to fully rationalize that I'll be burning most of the calories on the ride itself therefore the trip is completely in-line with my post-recipe testing, summer bikini season diet. Plus, they have ice cream with my close friend, bourbon. 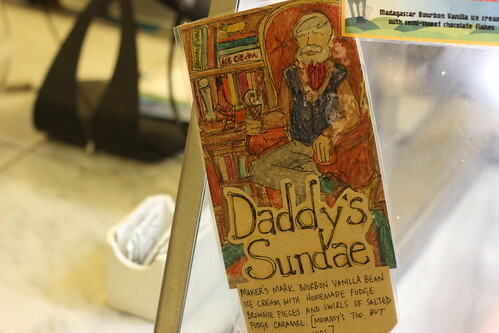 When I stopped by last week, they still had batches of Daddy's Sundae, a flavor only made for Father's Day. 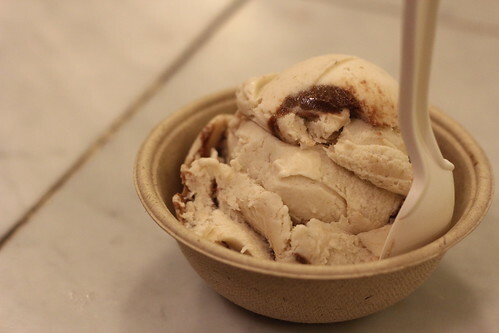 The base is Maker's Mark bourbon vanilla ice cream, brownie pieces and salted fudge caramel is swirled throughout. I could only lightly taste the bourbon, yet another customer exclaimed "Wow! You can really taste the bourbon in this!" Then again, bourbon and I have been super close lately; we stay up at night discussing boys and Farm Bills, so take my assessment for what you will. I felt it added more of a smoky quality to the vanilla ice cream than an alcohol taste. The chunks of fudge brownie were delicious little welcome breaks from the ice cream, while the fudge caramel added more chocolatey sweetness. If you're also bourbon's friend, I would recommend seeking this flavor out next June. Martha was Right! Coffee Ice Cubes are Awesome. It's Vendy's Time! It's Vendy's Time! Get Milkmade *Without* The Subscription! Go 4th and Eat Cake!